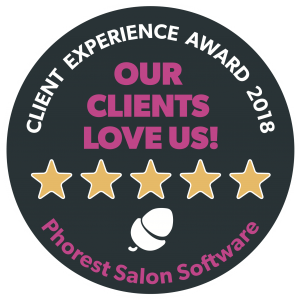 The Phorest Client Experience Award is based on reviews that clients post using our salon software after they leave the salon. It is not based on votes or a judging panel but purely on the experiences other paying clients have had in that salon. Salons need to keep their reviews consistently high at 4/5 or above for 12 months to be eligible. So, make that booking and don’t forget to leave an honest review on the salon’s Google or Facebook page about your experience, so you can have your say in who is awarded a Phorest Client Experience Award next year!